A great movie director once said that a motion picture is made in the editing room, the same is true for all types of screen recordings. Screencasting software that just lets you capture the screen on your computer is not enough to make a compelling YouTube video tutorial or a software walk-through since you'll have to use a video editing software to polish your screen recording. This is the reason why screencasting software products that also feature a video editor are a much better choice for Mac and PC users who want to create professional and visually pleasing screen recordings. In this article, we are going to take you through ten best screen recorders on the market that also offer video editing features. Wondershare's screen capturing software is equipped with a remarkably wide range of screen capturing and video editing features. Filmora Scrn lets you control every step of the screencasting process from selecting the area of the screen you'd like to record to export options that include all the most frequently file formats. You can capture a video at 120 fps, add markers while recording or insert speech bubbles and numerous other annotations if you opt for this screen capturing software. Its interface is modernly designed and easy to use, therefore you don't have to worry if you don't have much experience with screencasting because you'll learn how to use Filmora Scrn effortlessly. Provides powerful screen capturing and video editing features. Impacts the performance of video games. Advanced users may find Filmora Scrn's features underwhelming. The maximum frame rate for screen recordings is limited at 30fps. Screencasting with this software is easy because you can adjust the settings for a screen recording session and capture any desktop activity you want, with just a few simple clicks. 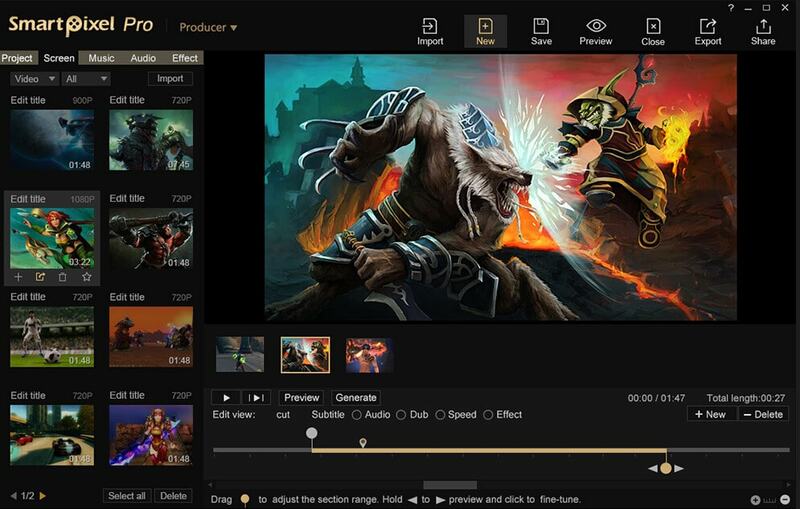 The software's video editing features are no less impressive than its screencasting options, which is great news for all screencasters who want to add visual effects, edit audio files or export their videos to the Internet directly from this computer program. Furthermore, Movavi Screen Capture Studio lets you produce PIP video, so its users can act as narrators in their own videos. Features every tool necessary for the production of professional screencasts. The software is prone to crashing. Movavi Screen Capture Studio's customer support isn't what you'd hope for. Camtasia is a video editing suite that also provides the screen capturing option. Its users can record an entire screen or just a small portion of it, which is the reason why it is a near perfect tool for the production of training videos, tutorials, and demos. Adding motion graphics or recording voiceovers after the screen capturing session are just a few out of many possibilities Camtasia offers. The software is equipped with a huge effects library that can be used to highlight important things in your videos or just to make the video look better. A free trial version of the software creates a watermark of your videos. Producing high-quality recordings for retina displays or recording iPhone and iPad displays are just a few of the amazing things ScreenFlow can do. This screen recording software for Mac computers lets you designate the area of the screen you want to capture, while it also lets you capture footage from a webcam. The impressive list of video editing features includes options like text and video animations or transitions, while the software's export options include MP.4 encoding, animated GIF export or ProRes. Very stable, even during demanding screen recording sessions. Even though Smarpixel Pro lacks some of the more advanced screen recording features, like markers or 4K support it is still a reliable screen recorder that can be used to capture any activity on a computer or Android Smartphone screen. Furthermore, the video editing tools it provides are far from impressive, but powerful enough to enable inexperienced screencasters to create professional screen recordings. Using a microphone to record your own voice is also an option, although the software's audio editing options are basic. Perfectly suited for beginners who want to learn how to create screen recordings. The Pro version of the software doesn't leave watermarks on your videos. Offers only basic video editing features. Over a million people using this screen recorder speak volumes about its efficiency. 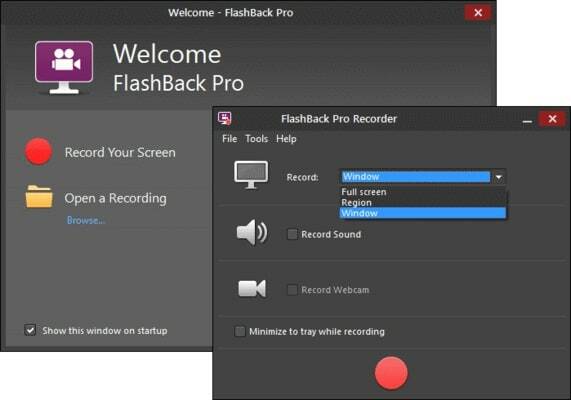 FlashBack Pro's screen recording tools are among the best in the industry and they enable you to specify the area of the screen you want to capture, set the frame rate or pick the video resolution that best fits the demands of the project you are working on. In addition, the software is equipped with a set of powerful video editing tools that allow you to enhance the screen recordings you make with FlashBack Pro and export them directly to some of the most popular video sharing platforms on the Internet. Not compatible with the Mac OS. Doesn't perform well while recording demanding video games. CamStudio is not the best or the most powerful screen recording software on the market, but it is reliable. This is the reason why experienced users should be better off using other screen recorders included on this list. Nevertheless, CamStudio is a great choice for everyone who wants to avoid a steep learning curve that they might experience if they opt for more advanced screen recorders. The screen capturing tools this software offers are basic, but they enable you to record video and audio content of a decent quality. Perfect for learning how to create screen recordings. Sharing videos online directly from the software is not an option. This is a perfect tool for the production of quizzes, software guides, and interactive content. Active Presenter is rated as one of the best screen recording software products in the industry designed to make a full-motion screen recording simple. Despite a rich list of screen capturing and video editing features, lack of experience with this type of software will prevent you from making use of its full potential. Active Presenter is probably the most efficient when used for designing responsive e-Learning content. The interactivity feature lets you define different learning scenarios. Allows you to create content compatible with mobile devices as well as Mac and PC computers. Active Presenter is not best suited for beginners. The free version of the software offers only limited screen recording and video editing options. Despite the fact that this software lacks some of the essential features needed for the creation of professional tutorials or demos, it still is one of the best screen recorders for the newcomers to the world of screencasting. Ezvid for Windows is an excellent choice for PC users who would like to make a screen recording as fast as possible. Drawing on the screen while recording or using the Voice Syntesys option guarantee that all videos produced with this software meet the highest screen capturing standards. Lets you control the video playback speed. Can't produce videos longer than 45 minutes. We hope that the screen recording software we included in this article will help you create stunning videos. Let us know in the comments which software from this list you like to use the most and feel free to hit the share button and let your friends know about these amazing screen recorders.